Yamaha’s high-powered portables are redefining the expectations for portable horsepower, from the F15 and F20 to the outstanding, new F25. Their single-overhead-camshaft, two-cylinder designs create power to weight that’s not only eye-opening—but in the case of the F25, it’s also class-leading and category jumping. In fact, the four-stroke 25 hp, previously a midrange outboard, is now so light, it’s jumped to our portable family. Like its new F15 and F20 siblings, the F25 has taken on signature portable advantages like an oil-retention system for leak-free, on-side storage capability, carry handles and resting pads. So whether you’re headed duck hunting with a jon boat or on the way to a lake cottage and your 14-foot aluminum boat, your Yamaha portable’s ready to go. Efficient Power: The F25, F20 and F15 all feature a two-valve-per-cylinder, single-overhead-camshaft design that provides better breathing and more power. Streamlined Intake: An intake silencer and manifold on the F20 and F15 result in more direct airflow, for minimum noise and maximum power. Responsive Acceleration: An acceleration pump on the F20 and F15 gives the engine the fuel it needs--when it needs it--like during rapid throttle advance. This ensures responsive acceleration. Optimal Operation: CDI Microcomputer Ignition monitors throttle position, engine speed and atmospheric conditions in order to precisely adjust ignition timing under all conditions for optimum ignition performance, ensuring smooth and reliable operation. Engine Warning System: Protects the outboard with a range of functions including: overheat protection and low-oil-pressure warning (automatically reducing maximum RPM to 2000), over-rev protection, start-in-gear protection and shift-in prevention at open throttle. Corrosion Protection: Combined with our proprietary alloy (YDC-30), our exclusive Phaze Five™ electro-deposited, anti-corrosive paint system provides a tough, five-layer barrier against corrosion. 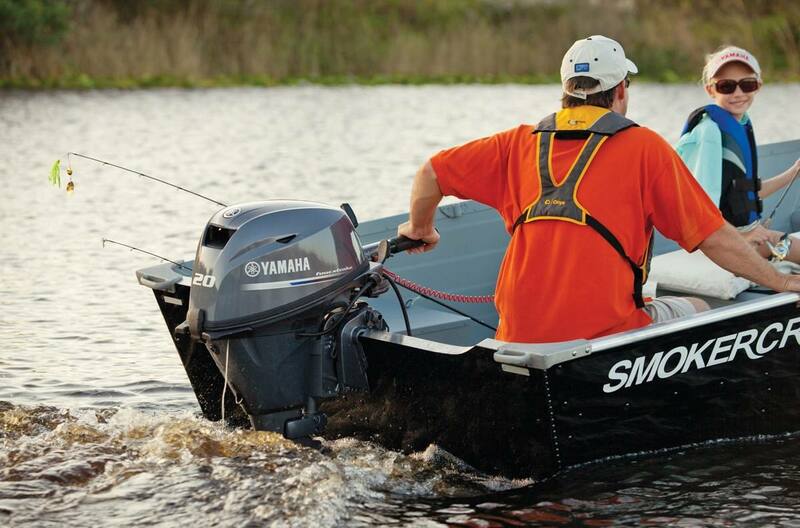 This protection is standard on all Yamaha Portable four-stroke outboards. Max Maneuverability: A 45-degree steering angle in each direction means great maneuvering potential. Portability and Storage: Incredible light weights, built-in resting pads and carry handles, an easy oil retention system and an optional folding tiller handle, allow for easy carrying and on-side storage without oil leakage or cowling scuffs. 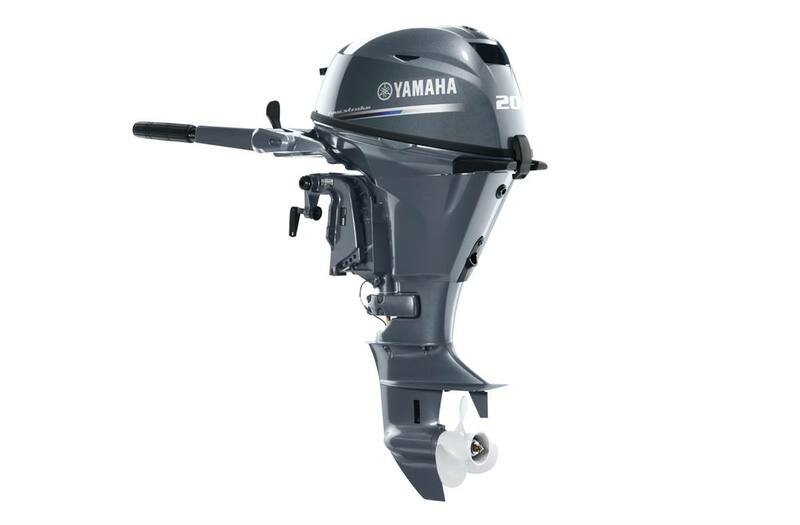 Our 362-cc 20-hp portable outboard, with its SOHC in-line design and streamlined intake manifold, delivers solid power. Not only that, but it’s one of the most fuel efficient in its class. At just 111 pounds, it’s suitable for lightweight craft such as aluminum fishing boats, tenders and inflatables. Weight refers to shortest shaft length, and is measured without motor oil, gearcase oil and propeller (except models 25 hp and under, which include a standard propeller). All Jet model weights include the jet pump assembly (weight estimated).